Oracle is a leading global IT player offering an integrated set of applications, databases, servers, storage and cloud technologies required by modern enterprises. Oracle solutions are categorized as Cloud Services, Databases, Middleware and Applications. Oracle cloud offers a set of services including SaaS, PaaS, DBaaS and IaaS. Oracle database is designed to run mission critical apps and comes in various versions and configurations. Oracle has a very large developer and partner ecosystem which together serve over several hundred thousand customers worldwide. Macaw Microservices Platform is now a certified listing in the Oracle Public Cloud (OPC) marketplace embedded with easy to deploy experience to all Oracle Public Cloud customers. 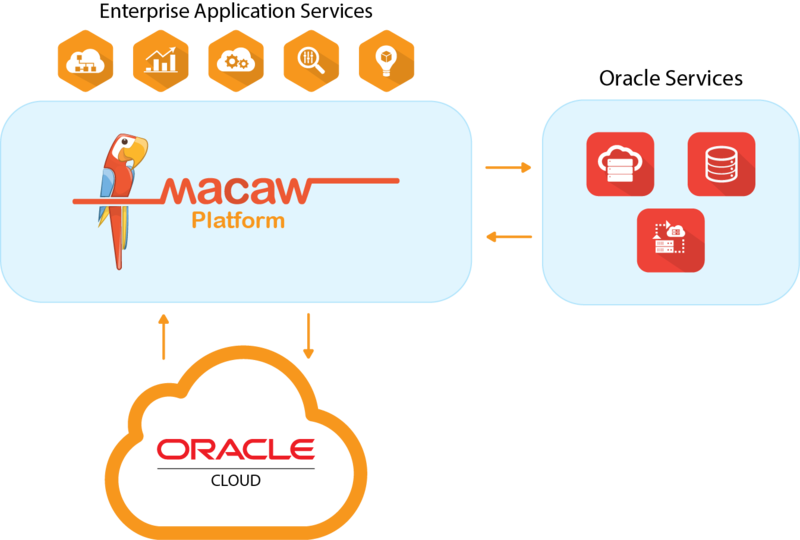 With this tight integration, Macaw runs optimally on Oracle Cloud while delivering a framework, set of capabilities and a platform to develop, build, deploy, run and operate cloud native apps that leverage Microservices architecture and Oracle services seamlessly. The solution supports many standard Microservices architectural patterns like service discovery, service registry, config management, load balancing, messaging etc. out of the box. Macaw platform provides a path for easy integration with other Oracle cloud services with extensible SDK, so that customers have access to broad Oracle cloud portfolio to innovate and evolve their applications on an ongoing basis. Oracle Cloud Services utilization in Microservices Architecture: Companies of all sizes rely on suite of Oracle products. Traditionally Oracle products were utilized heavily in monolithic applications deployed on-prem. Modernizing such traditional monolith apps involves running the apps on Oracle cloud in a containerized or Microservices architecture and allowing the apps to access Oracle cloud services without re-architecting the app or the cloud service. Cloud Native Applications: Cloud native applications leverage several innovative technologies and architectures to effectively operate in private, public or hybrid cloud. Macaw brings together leading and impactful technologies like Microservices, Containers, DevOps, and Automation to help accelerate enterprise’s journey to Oracle cloud. Application Modernization: Application modernization involves transforming legacy applications to operate under new paradigms like Containers, Microservices and DevOps automation. This is often driven by the need to infuse speed/agility into the development process plus simplify and automate operations.